Mel Gibson said "the Jews are to blame." He was drunk when he said it. He has since apologized. Update (2:15 pm, 8-5-06): This isn't Mr. Oliphant's first libel against the Catholic Church. The Catholic League for Religious and Civil Rights keeps track of these things. The report for 2002 can be found here; in fairness to Mr. Oliphant, the league's collection of his hate-cartoons is thinner in later years. This isn't even the first time Mr. Oliphant has drawn this image -- this appears to be a recycle of a 2004 cartoon, which drew a mea culpa from the Boston Globe for pubishing it. This is actually a very hard cartoon to interpret. One version: the nun is drilling into "Mel" that, if caught in a DUI, he shouldn't make slurs against Jews. In this version the Church, while abusive, is right, but Mel failed to learn the lesson. Next version: the nun is drilling to Mel that he should defame Jews if he is caugth driving drunk. This makes sense if O. (and his readers) assume that the Church (nuns) are nothing but vicious antisemites and want to preach that vicious gospel. The third version, perhaps most hateful, is that the nun (i.e. the Church) and young "Mel" both know that Jews are scum, but that he should learn to control his tongue, so that, if he should be stopped for drunk driving, he would avoid any untoward comments. Two out of three of these are vicious anti-Catholic bigotry, while the third is anti-Catholic stereotyping. This should be pointed out to the publishers of this cartoon and those with subscriptions should cancel them. Posted by: Fr. Augustine Thompson O.P. There's no reason for Oliphant to apologize. First, the church accepts corporal punishment as a means of enforcing doctrine. Second, most corporal punishment to enforce indoctrination to "faithful" perspectives is done against the youth. Third, according to the church the Jews committed Jesus Christ to be tortured and crucified. Fourth, Mel Gibson distributed his passion play Passion of the Christ a demonizing of man both Jew and Roman to the accolades of many catholics perhaps even the pope. Fifth, the cartoon truly portrays the ultimate value of the churches teaching which is: accept the dogma regardless of the less partial truth of one's heart and soul so that when you are beaten down by the world you will proclaim the dogma. Sorry, Father Thompson, but I don't think your first reading is tenable, either textually or contextually. (1) Textually, the caption at the bottom clinches it. Gibson is in the news for saying something objectively anti-Semitic. Hence "eventually got it right." If the point were "the Church tried to warn him against anti-Semitism," the caption would have to say something like "never did get it right" or "the adult Mel Gibson forgot what the boy had learned," or something to that effect. 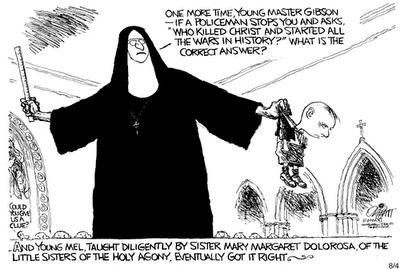 (2) Contextually, it is simply impossible to believe your first reading given some of the previous cartoons that Oliphant has done on Gibson and nuns and on other subjects Church-related. Oliphant is a walking summa of anti-Catholic prejudices who long ago sacrificed the benefit of the doubt. I know Fr. Thompson (from my days in Charlottesville). He's sharp. But I agree with Victor that perhaps Fr. Thompson was being somewhat charitable in his first reading. Is anyone else anxiously awaiting the diatribe orange_cross will let out when he's pulled over for a DUI? Grab some popcorn. Have you heard of such a thing as "proof"? And the principle that the stronger the assertion, the stronger the proof needed to support that assertion? I have heard of proof. I love proof, and its a foundation for a humane society. Does proof somehow come into the equation with Christianity and Catholicism. I thought this was a proof free zone, isn't everything here about belief without proof? Don't get me wrong, we do have to have some beliefs at the heart or axis of any logical reasoning or proofs that we might make. Unfortunatley some people prefer unreasonably complex beliefs in the place of reasonably simple foundational beliefs. that cowers in the light of day and changes only gradually under the unrelenting succession of real humane and loving investigations of life. It is going to change, and you're going to wonder why you objected to ordaining women and why you objected so much to gay marriage. You seem pretty peaceful about it though, which is excellent. I'm not sure what you're about, but I'm beginning to wonder if there is a language barrier. No offense, but how fluent is your English? And your second response to my request for proof, if it is meant to satisfy it, does not. It may be you don't understand what I'm saying to you. Or you don't care. I really don't know. I want to believe you're sincere, but to be honest, I'm beginning to have my doubts. Joan of Arc knows, I guess. Crunch, crunch. Popcorn anyone? I'm more than happy to share as we delve into the insightful comments of orange cross. You know, just the other day, while looking at one of da Vinci's paintings, the strangest thing occured to me ... Catholicism is the root of all evil and Leonardo tried to warn us all." Language barrier, Father? Oh, no. I'm afraid not. Will such 'traditionalists' burn in hell? Missale Romanum--where can I get it? Can the Church excommunicate pro-abort pols?